Stephen Curry is, outside of a few bright moments, having a miserable postseason that has continued into the Finals. Curry’s struggles raised eyebrows when the Warriors were winning, but now that they have dropped Game 3 in a 30-point loss, everybody is wondering what is wrong with the NBA’s MVP. It turns out that maybe the Cavaliers just aren’t getting enough credit for the defence. 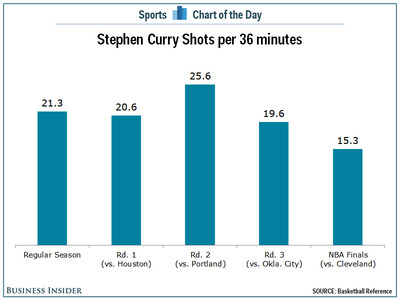 During the regular season, Curry had the ball in his hands an average of 86 times per game, according to ESPN. that has fallen to just 63 touches per game in the NBA Finals. In addition, the amount of time the ball is in Curry’s hands has dropped from 5.5 seconds per touch to just 4.5 seconds in the Finals. All of this has led to a huge drop in the number of shots Curry is taking in the Finals, just 15.3 per game, compared to 21.3 per game in the regular season. It appears that the Cavaliers’ game plan on defence is to just keep the ball out of Curry’s hands — and also Klay Thompson’s hands — as much as possible. That came back to haunt the Cavs in Game 1 when the Warriors’ bench scored 45 points. But that is not going to happen very often and it appears the Cavs are content with just shutting down Curry and Klay and letting everybody else try to beat them.